Workers situated in upbeat work settings are usually more efficient and productive. However, many companies struggle in creating these types of atmospheres for their employees, so they frequently consult with industrial or organizational (I/O) psychologists to create happy work environments that will maximize productivity. Industrial-organizational psychologists conduct research, consult or work directly with corporations. Those conducting research focus on principles associated with work productivity, including leadership and group cohesion. They utilize their research conclusions to develop strategies designed to create work settings conducive for worker satisfaction and productivity. The work performed by industrial-organizational psychologists benefits new, established, successful, and struggling companies. The success of many companies is dependent on the relationship between workers and supervisors. As a result, organizations will turn to industrial-organizational psychologists to develop strategies for improving this often fragile relationship. For example, I/O psychologists have discovered that employees that allowed to complete some of their work from home are happier and more productive than workers that are required to maintain a strict 9-5 work schedule. Likewise, supervisors also reported greater work satisfaction from these policies. This is just one example of how I/O psychologists help companies improve productivity. Although I/O psychologists are consulted to assist on a variety of issues, often different from their expertise, this creates job demand and prevents the job from becoming dull. Even during recessions, companies will rely on I/O psychologists to improve their work environments and employee relations. According to the U.S. Bureau of Labor Statistics, job growth for industrial-organizational psychologists is projected to grow by an astounding 53%, making it the fastest growing occupation in the United States through 2022. 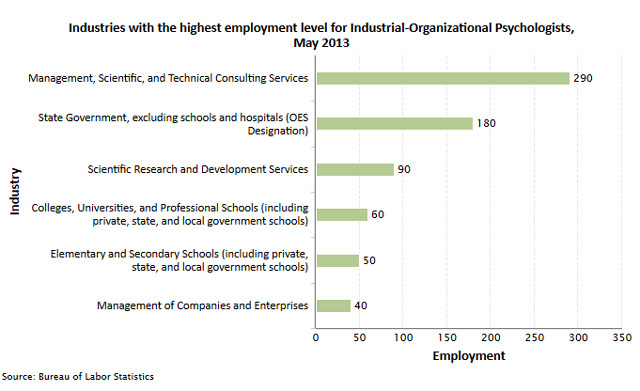 And at an average annual wage of $80,000, industrial-organizational psychology is also among the highest paying of all occupations (www.bls.gov). The education requirements for becoming an I-O psychologist are similar to those for becoming any other type of psychologist. Typically, entry-level employment opportunities require a master's degree in psychology with a specialization in industrial and organizational psychology. A master's degree program usually takes two years of full-time study to complete. Coursework and study typically revolves around the workplace environment with special focus on the psychology of organizational structure, leadership, and employee selection and development. I-O students will learn how to use psychological principles to build effective teams, address complex workplace issues, enhance employee-employer relationships, manage change, and engender a productive workplace atmosphere. Research and statistical analysis are also included in most master's level psychology programs. Depending on the school, students may be required to complete an I-O internship with a business or other organization. Some programs require students to complete a thesis or original research project. Other schools simply require student to pass a comprehensive exam at the end of their program. While a doctorate degree in psychology is not necessary for many I-O psychologist jobs, it is required for those seeking career opportunities in research or education. For I-O psychologists who have any inclination of working in clinical practice, earning a doctorate in psychology with a specialization in I-O is highly recommended. Most states now require practicing psychologists to have a doctorate degree before they can qualify for mandatory licensure. 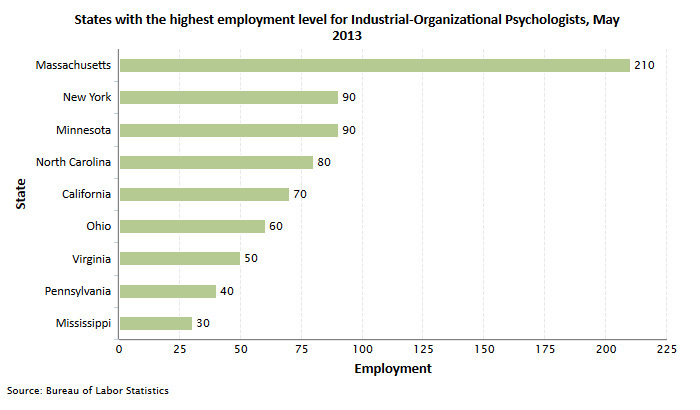 Since most I-O psychologists pursue career opportunities in business, licensing is not usually a requirement. Common career positions for an I-O psychologist include director of human resources, training and development specialist, employee relations manager, and organizational development consultant – none of which require licensing. However, in order to have a clinical practice or to even use the title 'psychologist' obtaining a state license is required. Licensing typically requires a doctoral level degree in psychology, completion of a 1-2 year clinical internship following graduation, and passing a state competency exam. Continuing education for licensed psychologists is a requirement. It is recommended for industrial-organizational (I-O) psychologists. Continuing education provides aspiring I-O psychologists the opportunity to hone their skills, enhance their knowledge and stay abreast of the latest techniques and strategies being employed in the field of industrial and organizational psychology.